The SERVPRO Difference is evident in our People, Training and Equipment. The People Our professionals are available 24 hours a day, 7 days a week, 365 days a year. 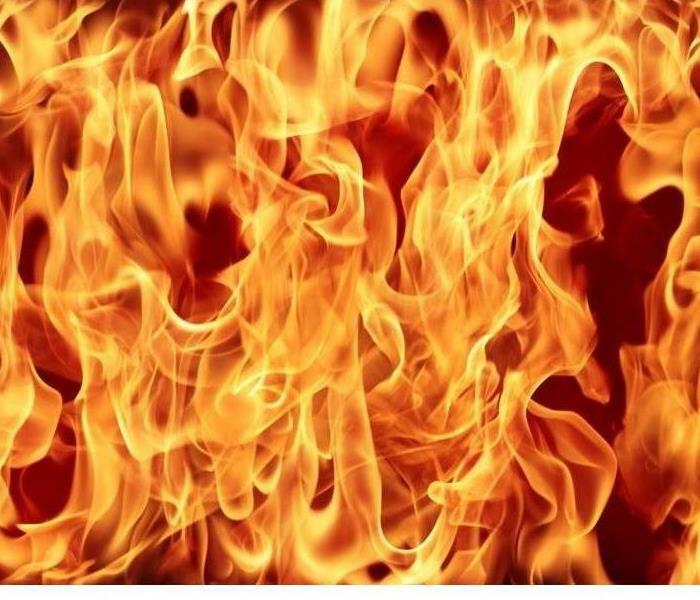 The Experience We have over 40 years of experience as a leader in fire and water cleanup and restoration. As such, we have earned the trust of the insurance industry, countless homeowners, business owners and property managers, as well as our friends at the Pentagon. The Training Our staff undergos extensive water restoration training and certification. We are IICRC-approved to ensure our training meets and exceeds accepted industry standards. 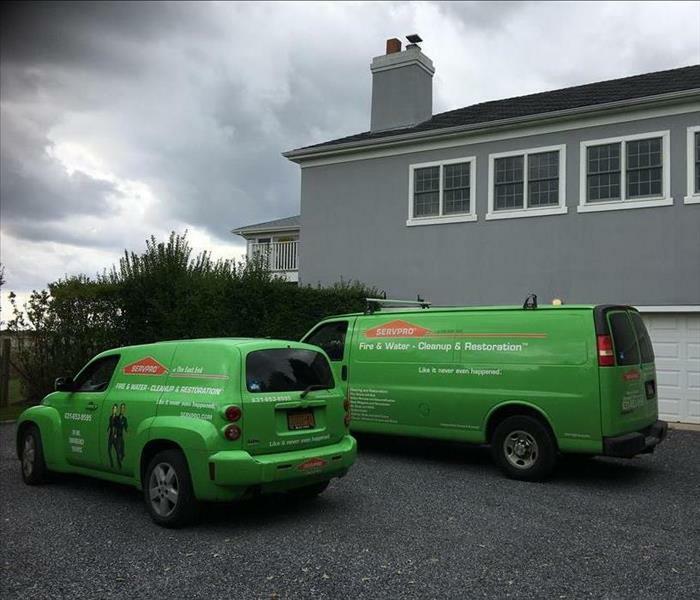 When you hire SERVPRO of The East End, you can be rest assured your property is in the best hands it can be to restore your property and your life. Since 1967 SERVPRO® has been helping property owners recover from from damages across the USA for over 50 years. Over 1,700 Franchises Nationwide More locations means faster response. SERVPRO of The East End will typically be on-site within four hours to start mitigation. 24-Hour Emergency Service In our business, you need us fast! The sooner we arrive, the better the chance we can reduce damage and save money. We are available 24 hours a day, seven days a week, 365 days a year. Trained, Uniformed Professionals Our trained, certified and uniformed professionals will walk you through the job process and then work quickly to restore your property to preloss condition whenever possible. The SERVPRO Emergency Ready Plan (ERP) is an invaluable tool for property managers, risk managers and commercial property owners. It allows the user to create an emergency ready profile of their facility containing critical information to help speed up response time after fire or water damage. Help is then just a few clicks away. A convenient mobile application stores property details, utility shut off locations, key contacts, damage photos, local weather and more. There is no cost to have SERVPRO of The East End help you create your ERP. And yet, the peace of mind it provides is priceless! Call us today at 631-653-9595 to set up your appointment to do so. Within 1 hour from your call, we will contact you to arrange for service. Within 4 hours of your call, we are on-site to start mitigation. By responding quickly to your call, we reduce the damage and save you money! We walk you through the job process, explaining what you can expect. Within 8 hours we provide you with a verbal briefing. SERVPRO of the East End is the East End's premier smoke, fire and water clean up and restoration company. We have been servicing the East End of Long Island for over 40 years. At SERVPRO of The East End, we hire and train the best people for the job(s) we are called to do. At SERVPRO of The East End, we use all of the latest state-of-the-art equipment to help tackle every job we are called to do. We start with Detection Equipment, including moisture sensors and meters that detects where moisture is hiding and how high the moisture levels are. Extraction equipment removes moisture, while Air Moving equipment enhances evaporation, thereby reducing drying time. Next our dehumidifiers extract water vapor from the environment, replacing them with warm, dry air. Finally, our deodorizing equipment produces a mist of deodorizing agents that pair with and neutralize odor-causing particles. This time-honored system, along with our state-of-the art equipment and IICRC trained technicians has been successful in mitigating damages of every size and shape to East End properties for over 40 years. 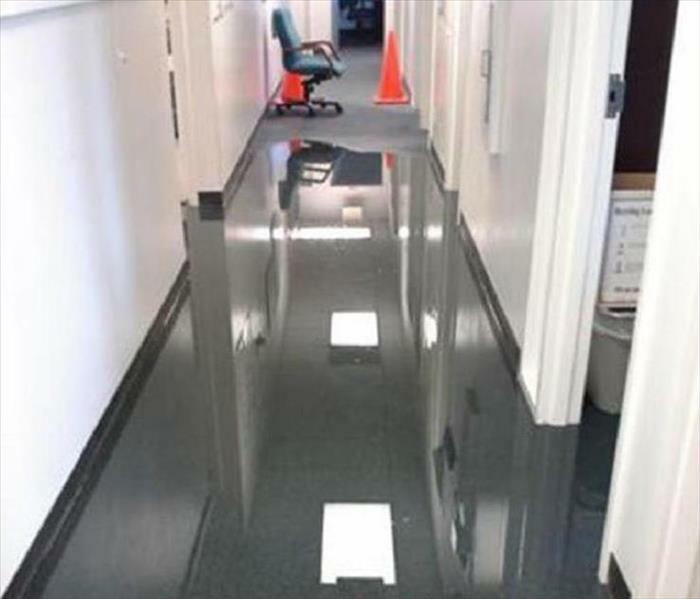 Because every flood and water damage event is a little different, each one requires a customized strategy tailored for the specific conditions of the job at hand. However, the overall water restoration process remains the same. The following steps offer an overview of our restoration process for what you can expect when we are called to remediate your water damage. 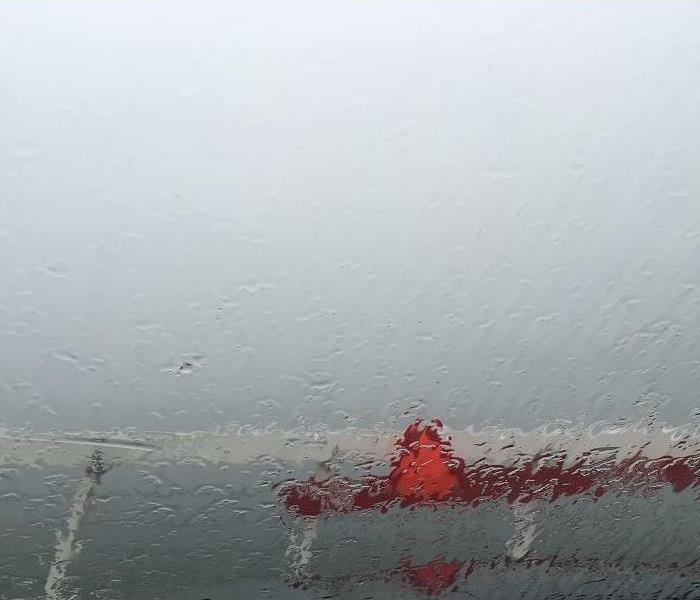 Through rain and snow and sleet and hail; Under grey skies or blue; In Winter, Spring, Summer or Fall, SERVPRO of The East End is there for you 24/7/365 for all of your cleaning, restoration and emergency needs, no matter how large or small the job. You will know us by our green trucks, uniformed staff, and state-of-the art equipment. Don't trust your home or business property to anyone but SERVPRO of The East End. We have been proudly serving our community on the East End of Long Island for over 40 years! SERVPRO of The East End Franchise Owner, Rich Fevola (left), welcomes Ken Dutton, Regional Operations Manager at SERVPRO Industiries, Inc. to our offices. 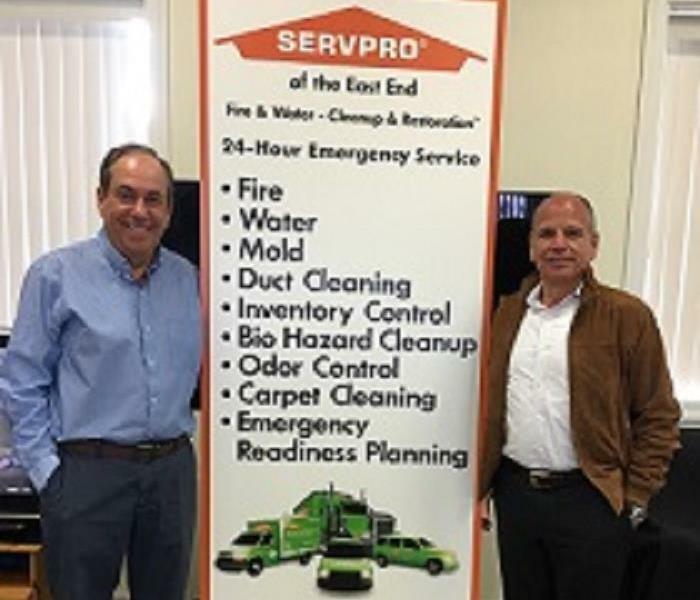 SERVPRO of The East End Franchise Owner, Rich Fevola (left), welcomes Fred Cohn, Regional Director of SERVPRO of Southern New England & New York, to our offices for a recent visit and tour of our facility. When an upstairs bathroom leaked, the water damage quickly spread to the kitchen and basement of this beautiful home. SERVPRO of The East End was there packing up the entire contents of all the rooms affected, including the contents of cabinets and closets in the kitchen and butler's pantry. We removed carpets and padding in the basement. We worked quickly to set up a number of dehumidifiers and fans to dry out the affected areas. These are just a few of our machines at work in one affected part of the house. Between our manpower and our machine power, SERVPRO of The East End gets the job done! The first 48 hours after a fire damage can make the difference between restoring versus replacing your property and personal belongings. SERVPRO of The East is here 24/7 365 days a year to help you regain control quickly! We are trained and certified to make fire damage “Like it never even happened.” Locally owned and operated on the East End of Long Island, SERVPRO of The East End has been serving our community for over 40 years. We have came to the rescue of many homes and businesses suffering from storm, fire, water and flood damages. Call us at 631-653-9595. The warm glow of a fireplace creates a beautiful ambiance in your home or business, and is a simple pleasure enjoyed by most. But, if not properly cleaned, maintained and serviced, a fireplace or wood burning stove can also pose a serious threat. 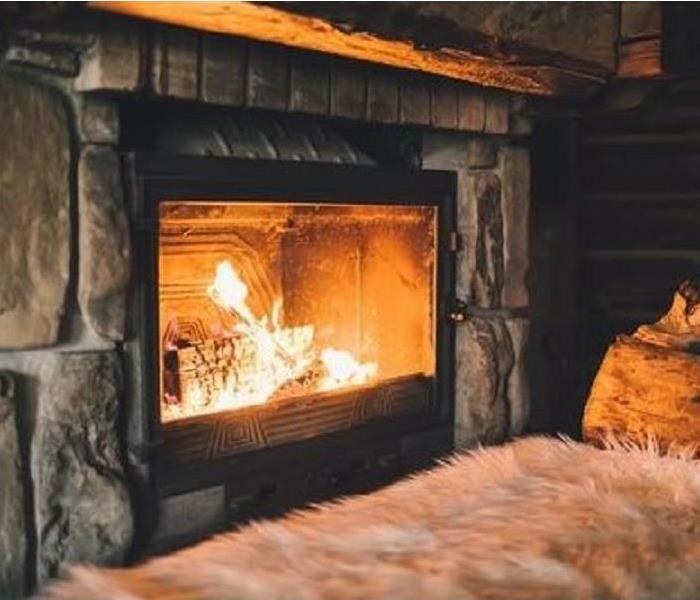 To keep the home fires burning safely, we recommend the following: A chimney cleaning is recommended at least once a year, but before calling the chimney cleaner, you will want to clean the ashes, soot and bricks inside the fireplace, and in the area surrounding. Check for loose or crackling bricks as well as crumbling mortar surrounding the bricks. The damper should be checked as well, for correct positioning and to ensure energy conservation and fireplace safety. When proper measures are taken, a fireplace can be a joy for many years to come. 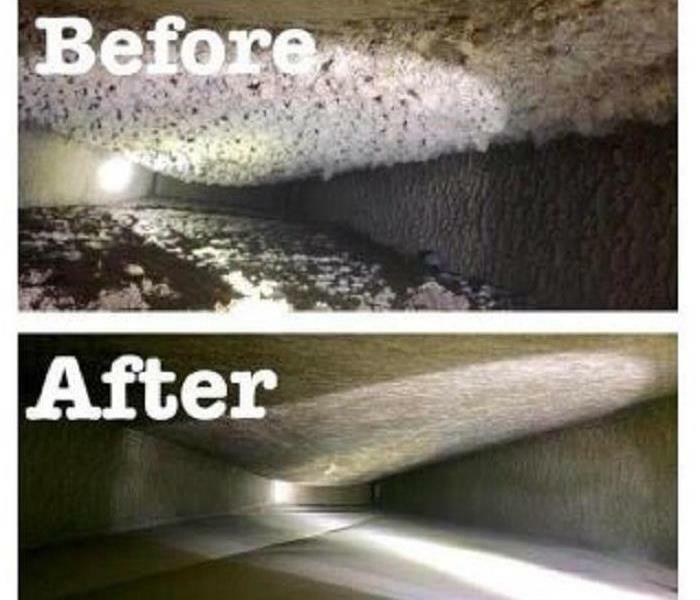 Your air ducts and HVAC units work hard through the seasons accumulating dust, pollen, dirt and debris. A ventilation system should be properly cleaned and deodorized regularly. This restores peak energy efficiency to the system, while eliminating offensive odors, reducing the potential for mold growth and insuring all your employees and clients are breathing in a better quality of air. Your commercial property’s appearance speaks volumes to your clients. 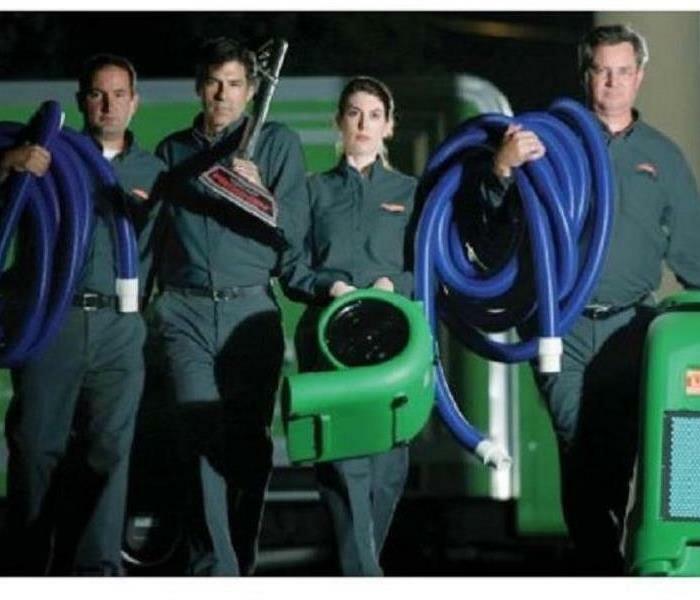 So when the need arises for professional cleaning or emergency restoration services, SERVPRO of The East End Professionals have the training and expertise to help make it “Like it never even happened.” In the over 40 years we have been in business, we have worked with the wide range of businesses, large and small, found in our community. These include but are not limited to: restaurants, vineyards, retail shopping centers, stores, healthcare facilities and hospitality facilities, schools, non-profits, golf clubs and beyond. Whatever the nature of your business, whatever your need, SERVPRO of The East End is here to help. Give us a call at 631-653-9595 to discuss your needs. Every mold infestation is different, from the extent and type of growth, to the variety of materials it has affected. Each job requires a customized strategy, but the general process always remains the same. Many people are surprised to learn that mold and mold spores are everywhere. Molds live in the soil, on plants, and on dead or decaying matter. Outdoors, mold plays a key role in the breakdown of leaves, wood, and other plant debris. Molds produce tiny spores to reproduce, just as some plants produce seeds. These mold spores can be found in the air both indoors and outdoors, and settled on indoor and outdoor surfaces. When mold spores land on a damp spot, they may begin growing. Thus, mold should be viewed as more of a moisture issue, than specifically a mold issue. It is important not to provide the moist environment mold needs to grow, especially in your home or workplace. That is where larger problems arise. Thus, the strategy to the problem is to find and eliminate the moisture source first, before removing the mold. Removing the mold alone does not solve the problem. If the water remains, new mold will grow in the same area. 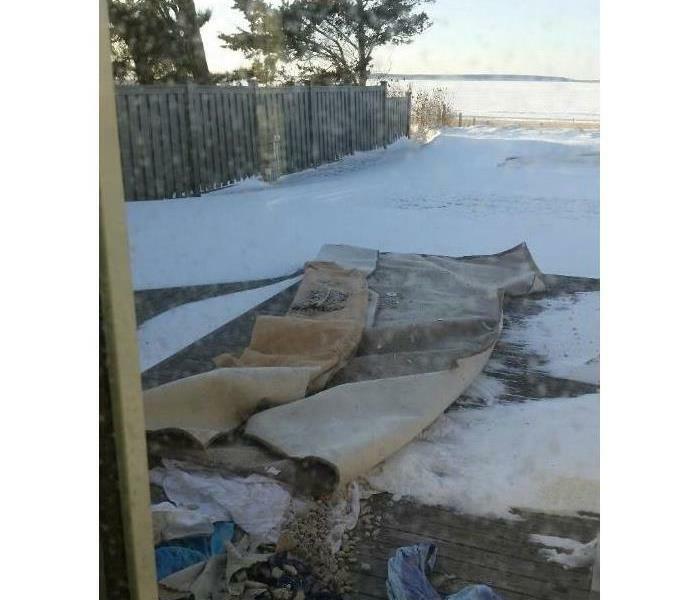 Like many of our clients, the homeowners of this house were away from their second home for the season when they walked in on this. 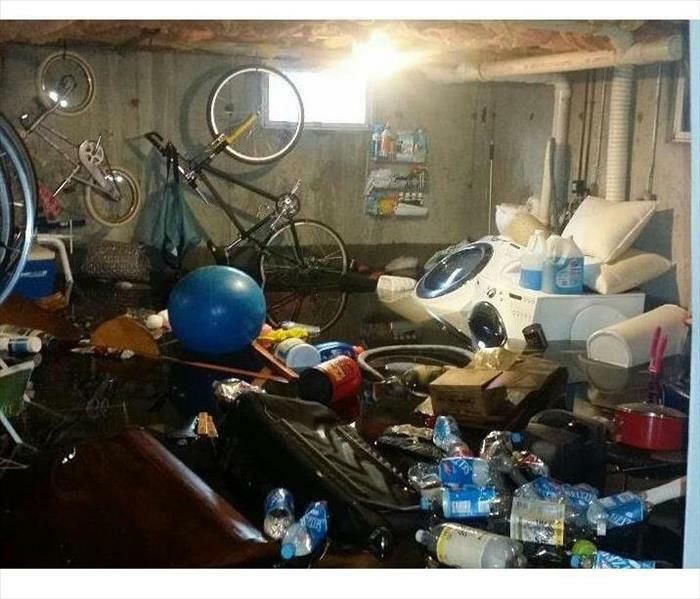 Precipitated by a winter storm, a frozen pipe broke in their attic, pouring water through the insulation, breaking through ceilings, and flooding through two floors below, soaking everything in its path. The damage done to the structure and contents was beyond words. Our team of trained and certified IICRC crew members worked tirelessly for several weeks tearing out damaged flooring, walls, carpets, furnishings and restoring the entire home to "Like it never even happened." We work with compassion, caring and respect for the families and businesses we serve, as well as for their properties, regardless of how small or big the job may be. Water damage from rain storms can have devastating effects on buildings and leak through cracks in the roof and siding. 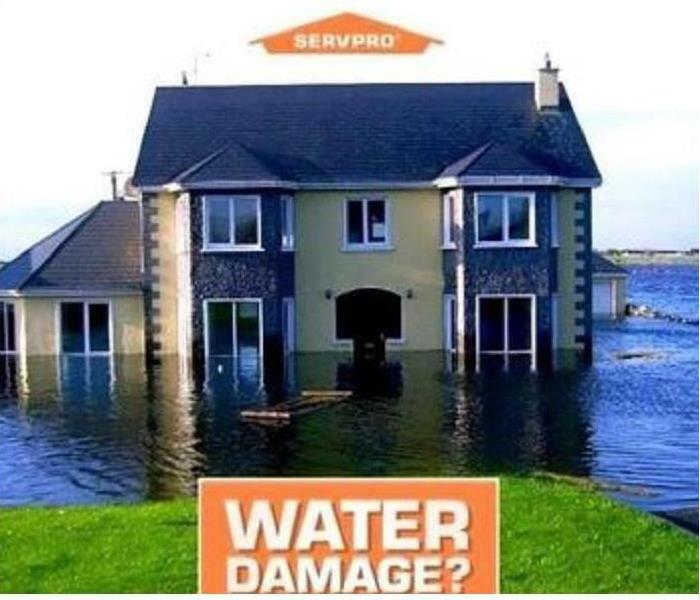 SERVPRO of The East End professionals are trained and certified to make storm damage “Like it never even happened”. We are locally owned and operated on the East End of Long Island, NY and serving our community for over 40 years. We have came to the rescue of many homes and businesses suffering from storm, fire, water and flood damages. Call us at 631-653-9595. 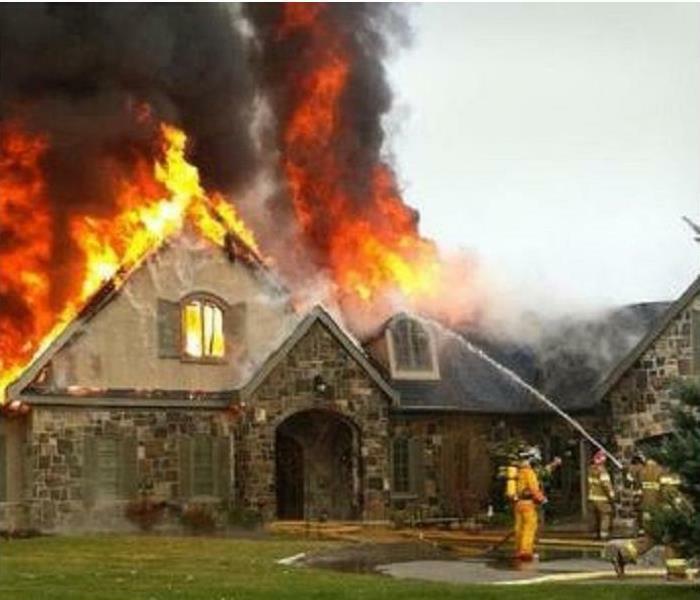 Fires can be devastating to your home or business. After the fire trucks leave, your property will likely suffer from a number of different types of damages. Besides fire and smoke damage, there will likely be widespread water damage and flooding from firefighting efforts. 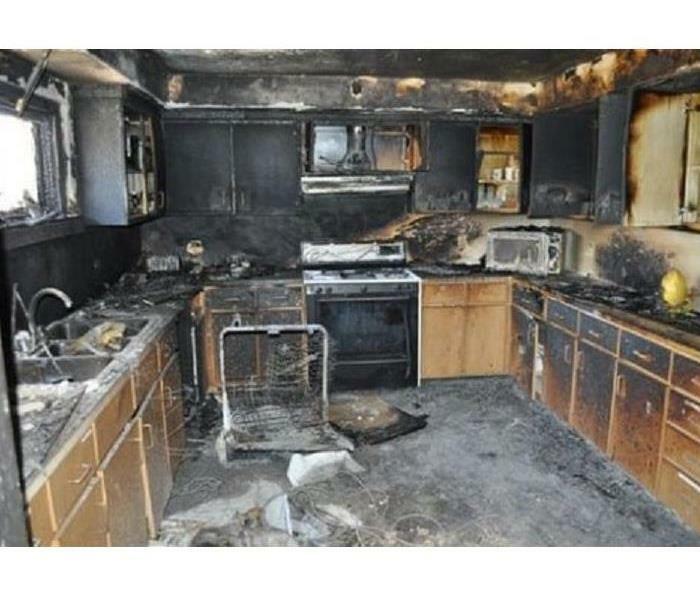 SERVPRO of The East End has specialized fire and water damage restoration training and experience to quickly clean up and restore your home or business to pre-fire condition. We can also remove the pervasive smoke odors and deep-clean inground soot from your upholstery and carpet. Our team of IICRC trained and certified professionals are ready 24/7 365 days a week to be 'Faster to any size disaster' and make it 'Like it never even happened.' Call us at 631-653-9595. Most water damage restorations require immediate action to prevent further damage from settling in. Water is particularly invasive, quickly spreading throughout your property while being absorbed into floors, walls, furniture and beyond. 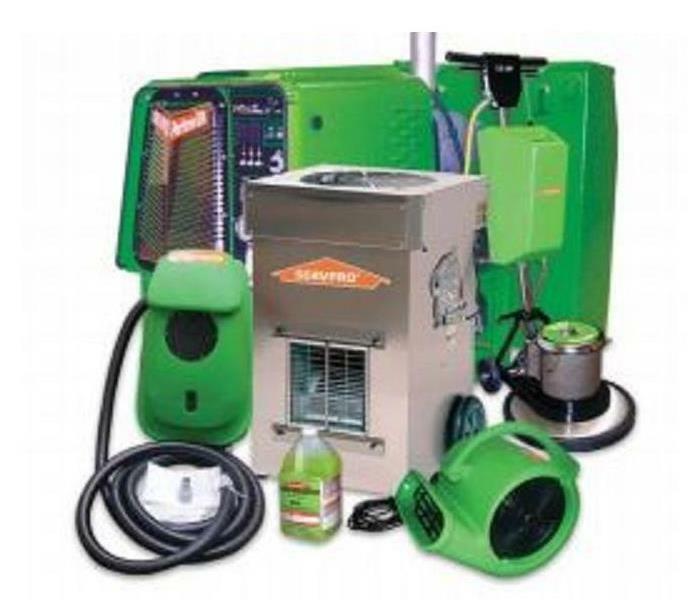 SERVPRO of The East End arrives quickly and gets to work immediately to insure the least amount of damage and cost to your home or business. At SERVPRO of The East End, we have the equipment, training, knowledge, experience and staff to get the job done 'Like it never even happened'. Coastal Winter Storms can cause a plethora of problems for home and business owners. Heavy winds cause leaks, pipes freeze and break, basements flood, causing water damages, which may also lead to mold infestation. The resulting damage to a property and its contents can become overwhelming. 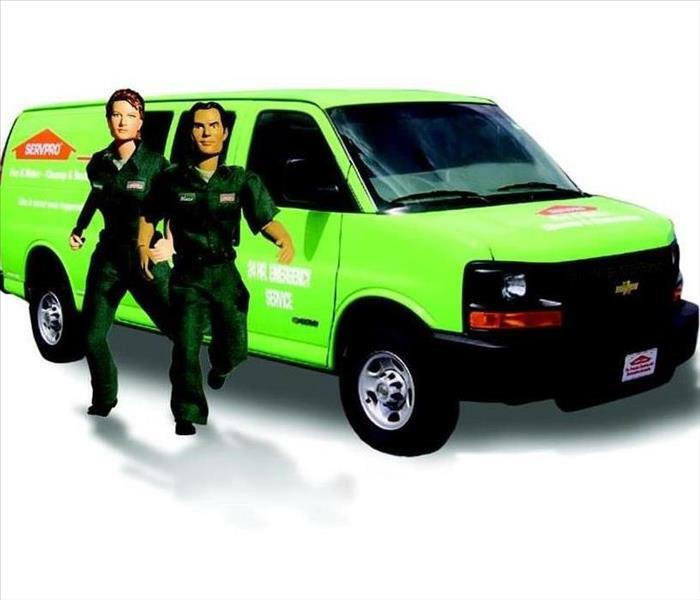 SERVPRO of The East End is ready 24/7 365 days a week to be 'Faster to any size disaster'. Our team of IICRC trained and certified professional have the experience, expertise and resources to know just how to handle your winter storm, water, fire and flood emergencies and make it 'Like it never even happened' while treating your family and property with the utmost of compassion, respect and understanding. Call us at 631-653-9595. 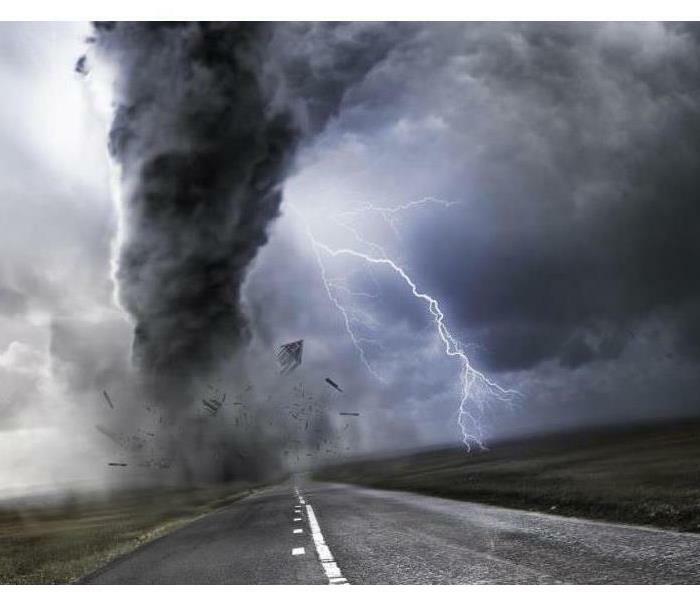 Did you know that thunderstorms can create fire damage in your home or business? Lightning striking your home can set your electrical lines on fire and create smoke damage, or any other material it happens to strike. When this happens, it leaves your home smoked up with a black residue (soot) all over your home or business. When water intrudes onto your property, mold growth can start in as little as 48 hours. Consider the following facts: Mold is present almost everywhere, indoors & out. Mold spores are microscopic, float along in the air, and may enter your home through windows, doors, or AC/heating systems. They may even hitch a ride on your clothing or a pet. Mold spores thrive on moisture. They can quickly grow into colonies when exposed to water. These colonies may produce harmful toxins. Before mold remediation begins, any sources of water or moisture must be addressed. Otherwise the mold may return. Mold often produces a strong, musty odor, which can lead you to possible mold problem areas. 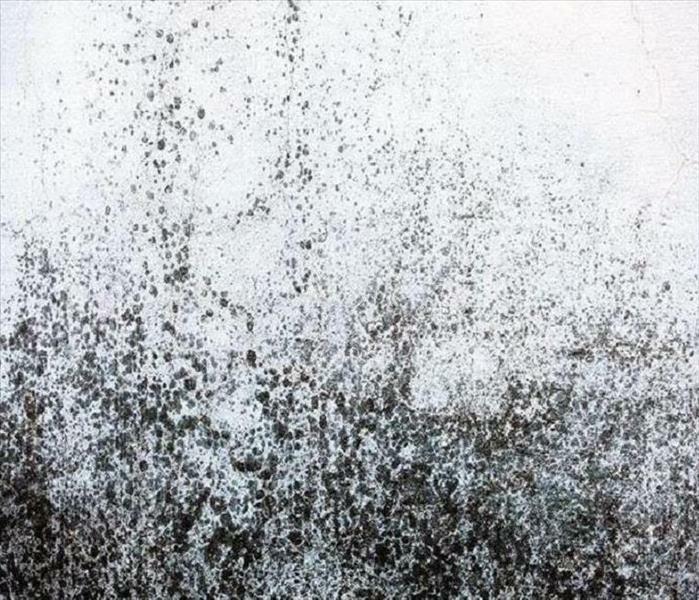 Even higher-than-normal indoor humidity can support mold growth. If you suspect you have mold, call SERVPRO of The East End at 631-653-9595. Our team of IICRC trained and certified professionals knows just how to handle your mold emergencies making it 'Like it never even happened'. When disaster strikes, its human nature to want to take immediate action and remedy the problem. When it comes to mold mitigation that is not always possible. There are things that can be put in place to limit the spread of mold spores and to limit exposure to it. But before mitigation can begin, the source of the moisture that the mold is feeding on must be addressed. If a water damage is ongoing and not stopped, mold may come back even if remediation is completed. 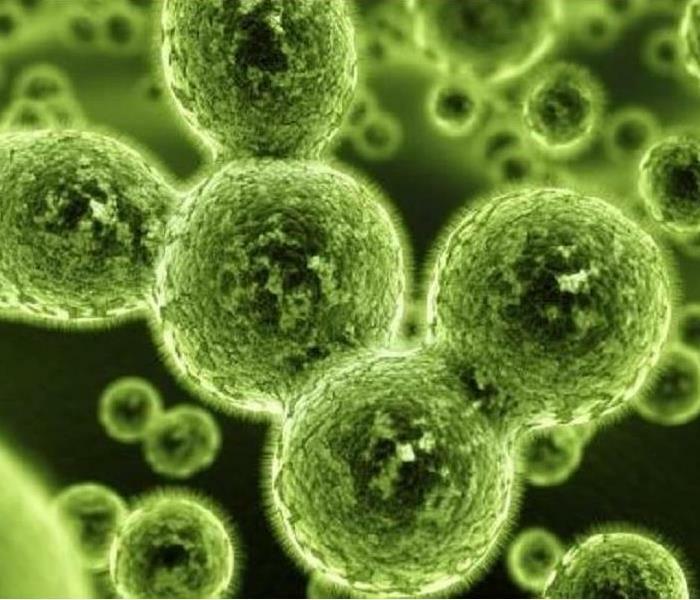 SERVPRO of The East End is able to come and inspect your home or workplace to see if mold is a real concern and to help identify the source of water damage that is ultimately causing the growth of the mold. We have been serving our community for over 40 years and helping to make it “Like it never even happened” for all of our customers. Call us at 631-653-9595. 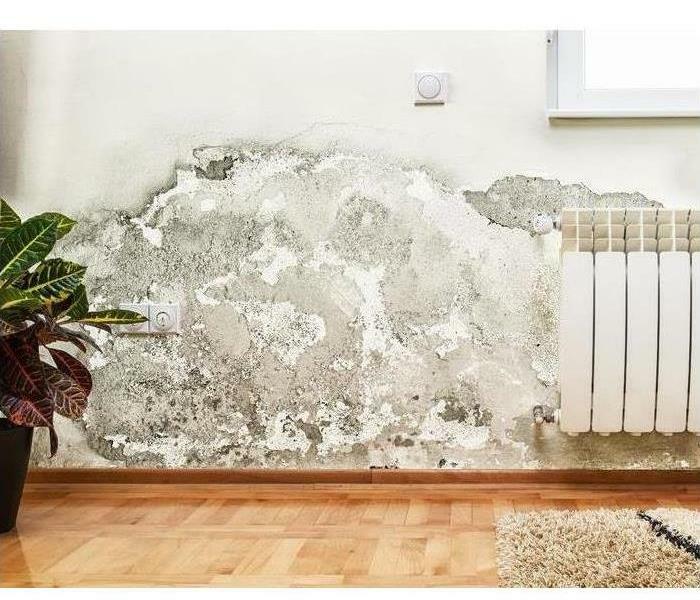 Water damages can quickly lead to mold if water is left to stand for any length of time in any residence or business. Mold can then spread throughout the property very quickly, producing unhealthy allergens and irritants you don't want to be breathing in. 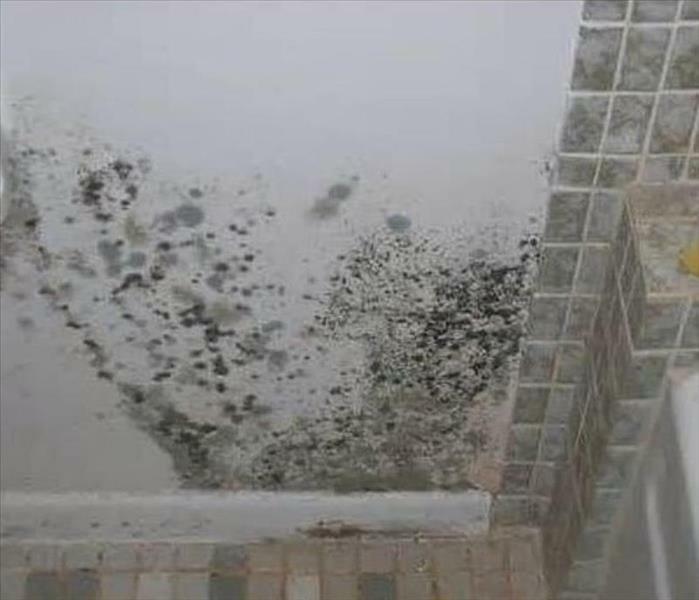 If you suspect you have a mold problem, SERVPRO of The East End has the training, equipment, and expertise to remediate your water damages and mold infestation to 'Like it never even happened.' Call us at 631-653-9595. 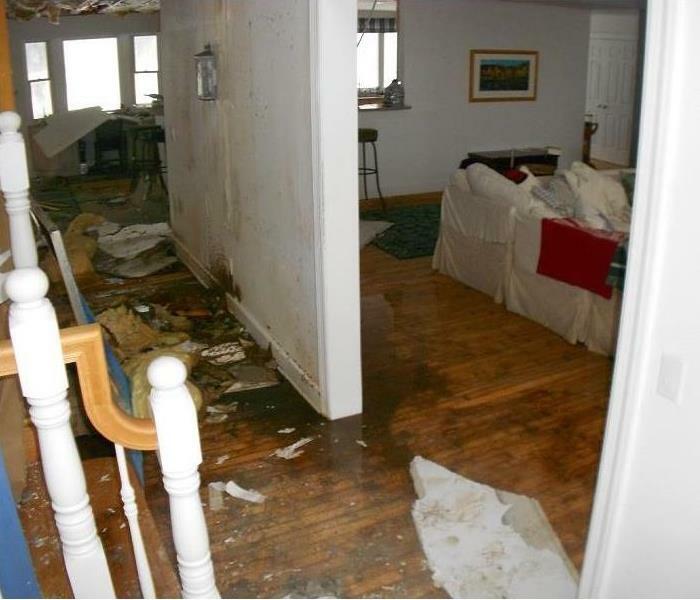 This family’s Southampton residence experienced serious water damage after a pipe burst in their beautiful home. Ceilings, floors and the contents of their Living Room and Dining Room were severely affected before SERVPRO of The East End arrived. 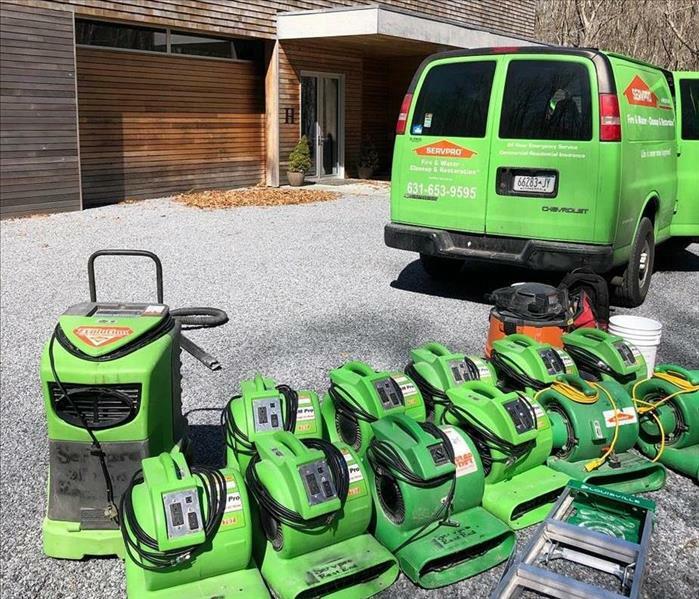 With an experienced crew, the right combination of equipment and an effective strategy to get the job quickly and efficiently, SERVPRO of The East End was able to mitigate the water damage in this home as it has been and continues to do in homes and businesses throughout the East End for Over 40 years. In this particular situation, we extracted the water, dried the carpet and walls, and removed whatever odors the damage may have caused. The family was grateful to be able to resume using the space again within the short time frame it took for us to get the job done. 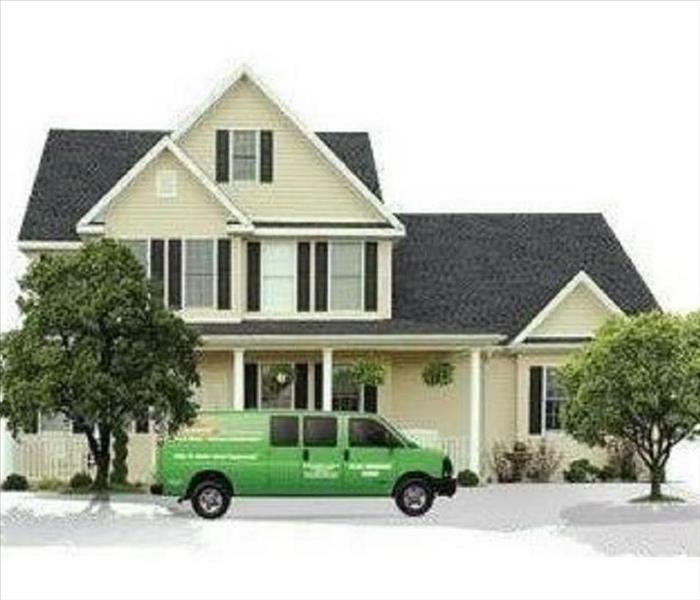 When SERVPRO of The East End shows up to your home or business, you can be assured that you are in professional hands. We have been the leading provider of Fire Water and Mold Cleanup and Restoration on the East End of Long Island for over 40 years. 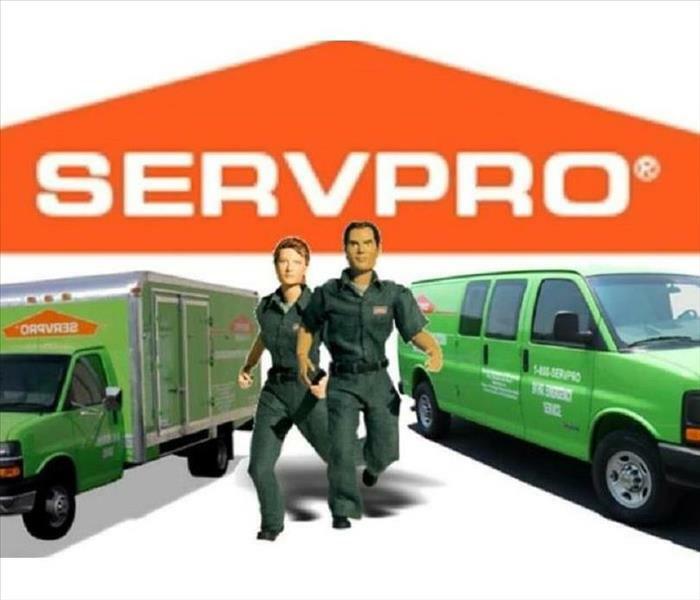 SERVPRO of The East End is ready 24/7 365 days a week to be 'Faster to any size disaster'. Our team of IICRC trained and certified professionals knows just how to handle your fire, water and flood emergencies, no matter how big or small. Call us at 631-653-9595. Exposure to biological and chemical contaminants poses serious health consequences. Failure to remove such substances contributes to unhealthy and dangerous environments. Here our crew members are suited up in Hazmat suits and respirators to protect themselves while safely removing contaminated materials from the basement of a commercial restaurant. SERVPRO of the East End Professionals are trained and certified to safely clean and remove biohazardous substances and dispose of them properly in accordance with OSHA and health regulations. Pipes burst. Storms happen. Floodwater rises. Fires erupt. A tree limb falls on your roof. Catastrophic water and fire damage can strike your home or business in any number of ways, at any time. Disasters don't plan ahead, or give us any notice. But you can. If your home or business is unlivable and mold is beginning to grow, you need answers and quick action. In your hour of need, SERVPRO of The East End can be that answer. Whether your disaster is caused by rain and wind or fire, we have the resources, experience and training to help make your house a home again and to get your business back up and running as soon as possible. 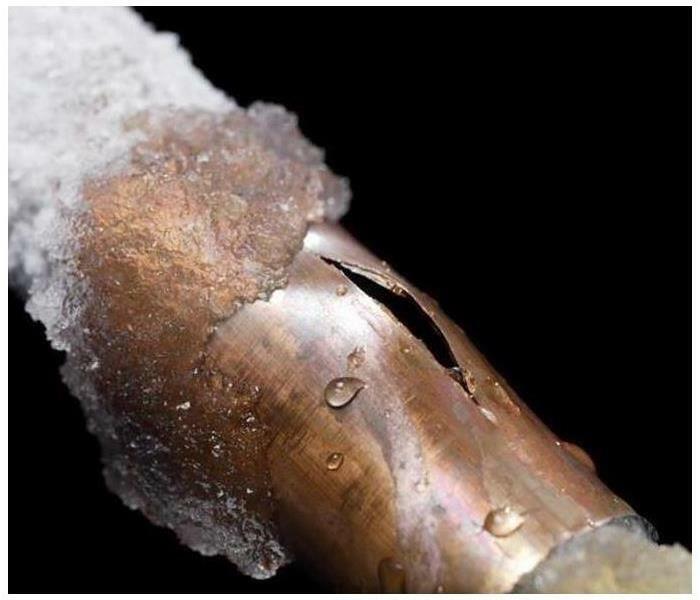 Freezing air and fluctuating temperatures make your property prone to water damage resulting from frozen pipes. When water is exposed to freezing temperatures, it begins to expand resulting in increased water pressure and pipes bursting. Water damages incurred from pipe bursts often result in a significant amount of damage in both residential and commercial properties. 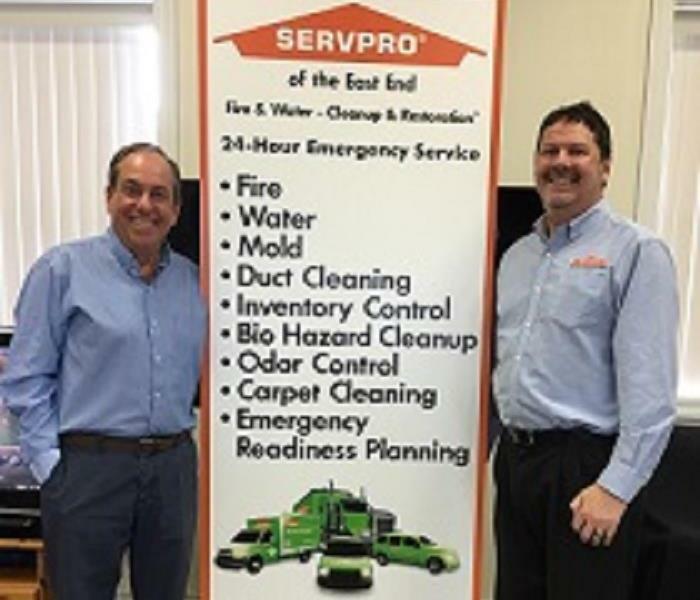 SERVPRO of The East End is ready 24/7 365 days a week to be 'Faster to any size disaster'. Our team of IICRC trained and certified professionals knows just how to handle your fire, water and flood emergencies to make it "Like it never even happened." Call us at 631-653-9595. After a fire, you may have a strong residual smoke odor even after a full cleaning has been performed. Smoke odors can penetrate materials and get in to hard to reach crevices. In order to completely remove smoke odor we use an Ozone Generator that is used to oxidize odor. In addition to smoke odor, an Ozone Generator can be used to eliminate odors from pets, mildew, organic pollutants and more without the use of chemicals. Here the Ozone Generator is being used in combination with an Air Scrubber in the basement living area of a residential East End home after a fire damage. We recommend customers having their contents and structure ozoned following fire restoration to ensure all odors are removed. An air scrubber is a portable filtration system that removes particles, gasses, and/or chemicals from the air within a given area. These machines draw air in from the surrounding environment and pass it through a series of filters to remove contaminants. Here we have an air scrubber set up in a retail store to restore the air quality back to 'Like it never even happened' after a water damage. A private residence on The East End of Long Island in the aftermath of a traumatic kitchen fire, which caused significant structural, smoke, odor and soot damage to the property. SERVPRO of The East End sent our experienced team in to quickly and efficiently clean and remediate the damage making it "Like it never even happened." Our crew is available 24/7 365 days a week for Fire, Water and Mold Emergencies. Call us at 631-653-9595 to discuss your needs. 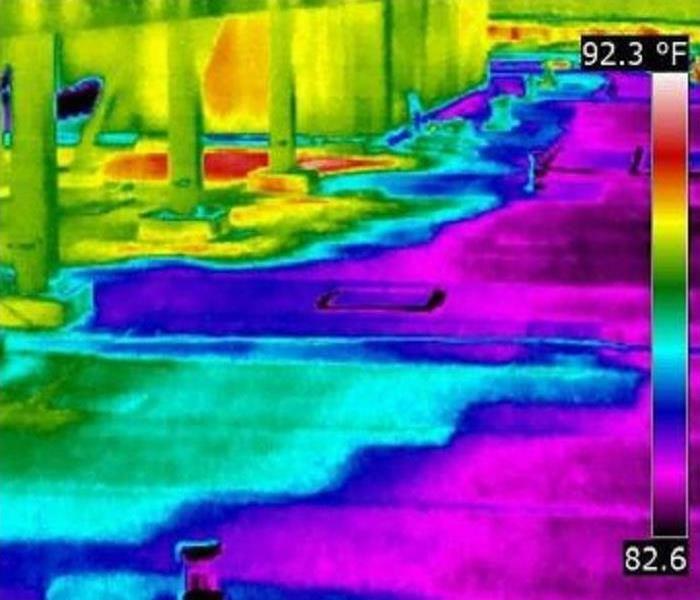 Our FLIR E6 camera gives us the advantage of thermal imaging to discover temperature issues we can’t see with a typical IR thermometer. With this technology, we can work more quickly—and know that we won’t miss anything vital. The E6 helps us identify heat patterns, reliably measure temperature, and store images and data for reports for insurance claims. 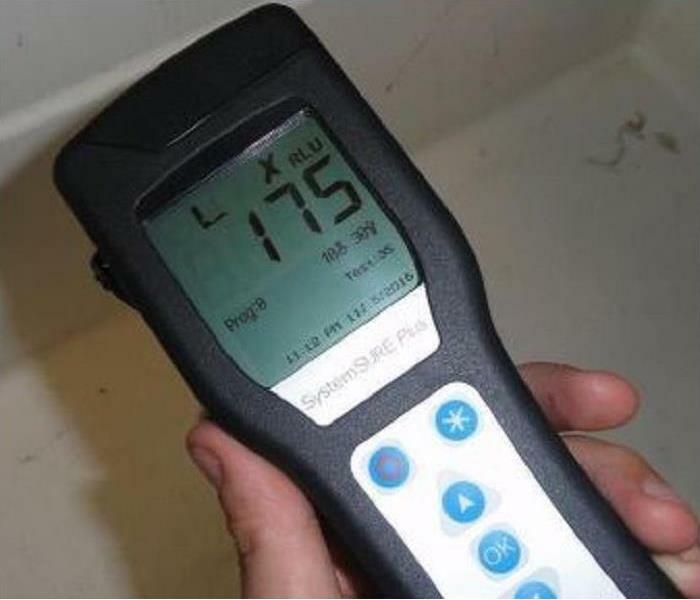 The speed, accuracy and sensitivity of the Hygenia SystemSure Plus Luminometer make it an ideal tool for mold and bacteria testing, healthcare infection control and environmental services monitoring. ATP testing can be an essential tool for providing the needed bio-contamination data for ensuring quality assurance. It is just one of many tools our trained professionals use to asses the job ahead of them. 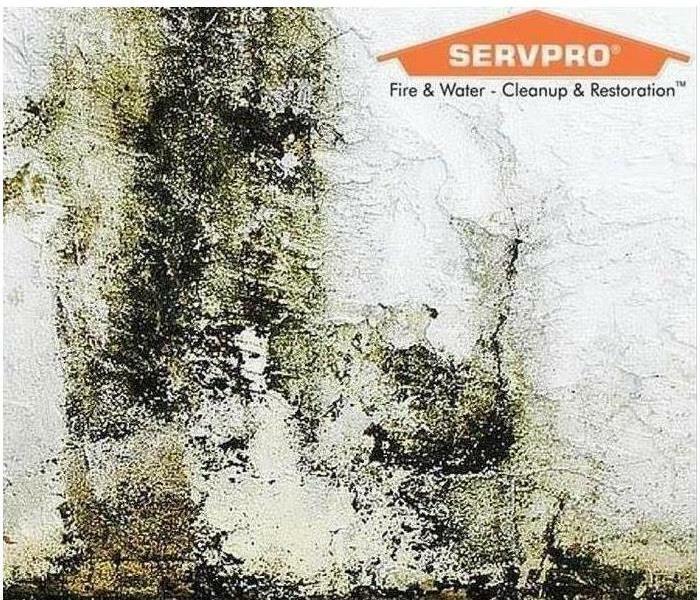 If you see signs of mold, call SERVPRO of The East End today - 631-653-9595. Industrial strength air movers and dehumidifiers are able to quickly remove absorbed moisture from ceiling, walls and floors of your home or business after a water damage event. Proper drying helps to prevent swelling and warping of floors, walls, and furniture as well as preventing further damage from mold. Here we have an army of air movers and dehumidifiers ready to take on the flood damage in the basement of a commercial property. At SERVPRO of The East End, there is no such thing as a job that is too big. 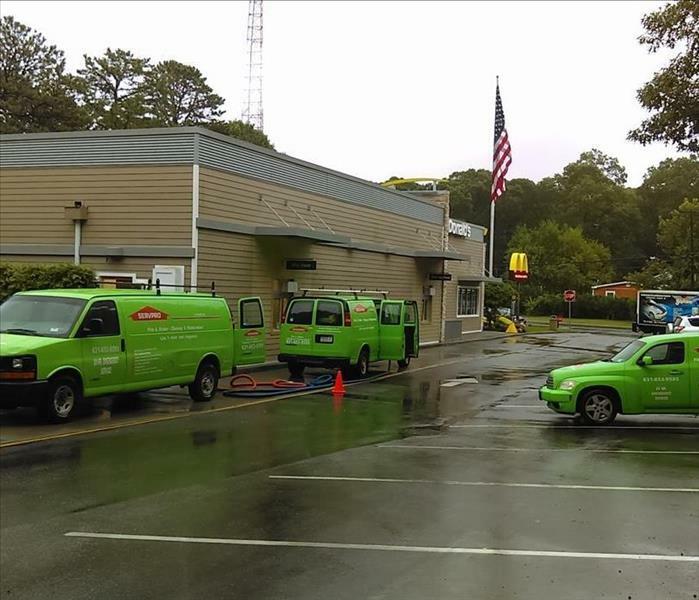 SERVPRO of The East End uses powerful truck mounted equipment for faster water damage extractions. We have the training, experience, and equipment to handle small and large flooding or water damage emergencies. Call us at 631-653-9595.